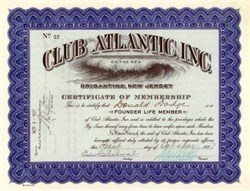 Beautifully engraved membership certificate from the Club Atlantic, Inc. issued in 1927. This historic document has an ornate border around it with a vignette of a wave breaking. This item is hand signed by the Company’s President and Secretary and is over 85 years old. Brigantine is an island city in Atlantic County, New Jersey, United States. As of the 2010 United States Census, the city population was 9,450. What is now the City of Brigantine has passed through a series of names and reincorporations since it was first created. The area was originally incorporated as Brigantine Beach Borough by an Act of the New Jersey Legislature on June 14, 1890 from portions of Galloway Township, based on the results of a referendum held on June 3, 1890. On April 23, 1897, the area was reincorporated as the City of Brigantine City. This name lasted until April 9, 1914, when it was renamed the City of East Atlantic City. On March 16, 1924, Brigantine was incorporated as a city, replacing East Atlantic City and incorporating further portions of Galloway Township.